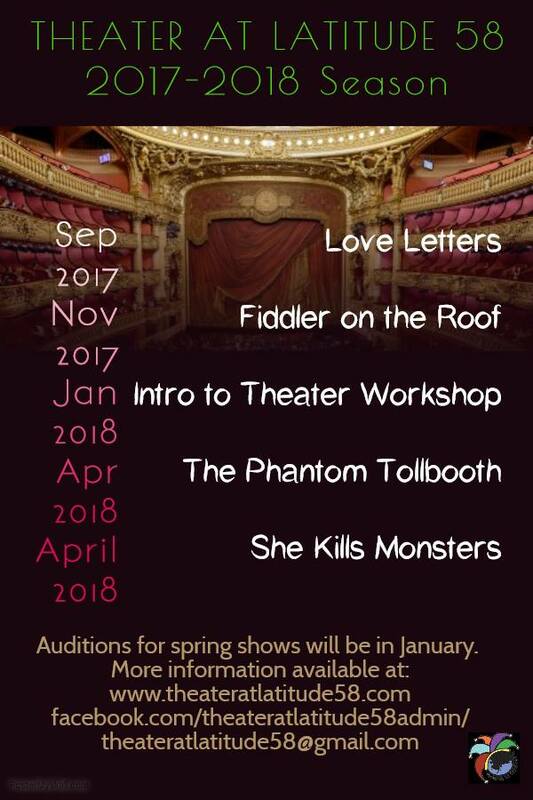 Come join us this spring – we’re gearing up for our spring plays and Intro to Theater workshop, all starting in January! Parent/Performer Orientations will be Thurs (1/11/18) & Fri (1/12/18) 6pm – 8pm, and auditions Saturday, 1/13/18 10am – 3pm. Intro to Theater Workshop – First class on Thurs (1/11/18) at 4:30pm. Class size is limited – please email theateratlatitude58@gmail.com to reserve spot and receive full class description. Here are Milo’s adventures in the Land of Wisdom, where he’s forced to think about many new things. Milo learns of the argument between King Azaz and his brother, the Mathemagician, whose disagreement over words and numbers has led to the banishment of Princesses Sweet Rhyme and Pure Reason. Milo is dispatched to rescue the princesses from the Land of Ignorance. The knowledge and skills Milo picks up on his journey help him to save the princesses. When he must return home, Milo’s sorry to leave his friends – but enriched by his experience, he realizes his attitude toward learning will never be the same. For more information and a full description of plays, rehearsal location, performance dates, and tuition requirements, please contact us. This entry was posted in Public Blog and tagged Auditions. Bookmark the permalink. ← Fiddler on the Roof Auditions!